The Centre is in no mood to soft paddle on the counter-insurgency operations in Assam though a number of top insurgent leaders have been arrested recently, leading to improvement in the security situation in the state. The Supreme Court today stayed the execution of Aftab Ahmed Ansari, sentenced to death for his involvement in the attack on the American Centre in Kolkata in 2002 that left six policemen dead and 14 injured. A Delhi court today directed the Central Bureau of Investigation (CBI) to send the body of urea scam case accused, AE Pinto, to London immediately. The court’s decision came after Pinto’s wife Eugenia Teles sent an e-mail pleading that her husband’s body should be sent back. The investigation team of DGCA (Directorate General of Civil Aviations) today finally recovered the digital flight data recorder (DFDR), commonly known as black box, the most vital source of information, from the crash site of the Air India Express aircraft at Mangalore. After joining other parties in the Lower House of Parliament on May 7 to demand caste-based Census, the BJP appeared backtracking here today following outright opposition of the RSS to this. With the BJP virtually out of reckoning in the race for Jharkhand Chief Minister’s post, the Congress appears to be playing around with Shibu Soren (the incumbent), without really ready to support his JMM-led government. Gearing up its soldiers for future warfare, the Indian Army feels there is an urgent need to replace the indigenously developed and manufactured the INSAS series of rifles. India has taken up with the Canadian High Commission the denial of visa to a retired Border Security Force (BSF) trooper and expressed serious concern over the issue. The suspected Maoists today shot at and injured two persons, one of them a former CPM leader, at Jhargram in West Midnapore district where a bandh disrupted normal life for the second day. Eleven passengers suffered minor injuries when 14 coaches of the Guwahati-bound Rajdhani Express derailed at Amba halt between Kharik and Naugachia railway stations in Bihar today. Rail traffic has been disrupted on the section due to the derailment. Abdul Samad Bhatkal, a prime suspect in the German Bakery blast in Pune, was today remanded in police custody till June 1 by a local court in connection with a 2009 illegal arms seizure case. The National Investigation Agency chargesheet in the Margao serial blasts has alleged that a 20-year-old engineering student was the technical mind behind the incident on Diwali eve last year. The killer heat wave in northern, western and central India is stated to have claimed more than 23 lives, including those of three CRPF personnel. As of now, severe heat wave conditions continue to prevail over Rajasthan, Madhya Pradesh, Punjab, Haryana, western Uttar Pradesh, Telangana and Vidarbha regions, but the situation is expected to change soon. A day after asserting that peace with Pakistan was necessary for India to realise its full development potential, Prime Minister Manmohan Singh sent some 20 kg special Alphonso mangoes to his Pakistani counterpart Yousaf Reza Gilani. But the spirit of ‘mango diplomacy’ was marred by the Pakistan Supreme Court dismissing appeals challenging the release of Mumbai attack plotter and JuD chief Hafiz Saeed from house arrest. The Defence Institute of High Altitude Research (DIHAR), Leh, has been bestowed the Innovation for India Award-2010 under Public Service Category for its contribution in agro-animal technologies for the benefit of troops and civilian population of the Ladakh region. The Centre is in no mood to soft paddle on the counter-insurgency operations in Assam though a number of top insurgent leaders have been arrested recently, leading to improvement in the security situation in the state. The Centre has assigned Assam Chief Minister Tarun Gogoi the task of taking care of political process with insurgent groups. Union Home Minister P Chidambaram today said, “There will be no let-up in the counter-insurgency operations in Assam till all insurgents give up arms and join the political process, though a number of top insurgent leaders were arrested recently.” The Home Minister, who was on a day-long visit to Mizoram and Assam, reviewed the insurgency situation in Assam during a meeting with Chief Minister Tarun Gogoi and the counter-insurgency unified command (UC) structure comprising the Army, the police and paramilitary forces at the Raj Bhawan here. “All are aware about the dramatic improvement in the security situation in Assam. We have been able to apprehend a number of leaders of insurgent groups, including ULFA, the NDFB and the DHD (J). In the meeting today, we reviewed not only the security situation but also the political process (for finding solution to the insurgency problem). The security forces have been instructed to continue implementing the policy (counter-insurgency strategy) that has been in force for sometime now,” he said. The Home Minister arrived at Aizawl in Mizoram in the morning and held discussion with Mizoram Chief Minister Lal Thanhawla on the issue of repatriation of Bru refugees from Tripura and the security scenario there. Expressing satisfaction over the recent return and rehabilitation of 215 Bru families to the state, he asked the Mizoram Government to ensure that all Brus who fled the state in 1997 returned to their villages. Chidambaram laid stress on early completion of the barbed wire fence along the Indo-Bangladesh border in Mizoram, and asked the state government to settle the compensation cases arising out of land acquisition at the earliest. A vacation Bench comprising Justices GS Singhvi and CK Prasad directed the West Bengal Government to submit its response within 16 weeks to a petition filed by Ansari, challenging his conviction and the capital punishment. Earlier this month, the SC had stayed the execution of another death-row convict, Jamiluddin Nasir, in the case. A Division Bench of the Calcutta High Court had, in February this year, confirmed the conviction of Ansari and Nasir. The HC had, however, commuted the capital punishment awarded to three others to imprisonment for seven years. In April, 2005, a trial court had awarded death sentence to five accused, including Ansari and Nasir, but acquitted two others. Ansari was a member of the terror outfit Asift Reza Commando Force (ARCF) that reportedly had links with the Harkat-ul-Jehadi-e-Islam. He was arrested from Dubai and subsequently deported to India on February 9, 2002, to face trial. Riding motorcycles, the AK-47 assault rifle wielding terrorists had fired at policemen posted outside the American Centre on the Jawaharlal Nehru road early in the morning of January 22, 2002. Taking on record the application filed by Teles’ counsel, Wills Mathews, special judge Pradeep Chaddah asked the probe agency to make immediate arrangements for sending the body of 63-year-old Pinto back. “The CBI will try to get the matter expedited and dispatch the body after due formalities. Let the required be done in a day or two,” the court said. Pinto, a London-based Brazilian businessman, died of heart attack at Ram Manohar Lohia Hospital on Monday. In her application, Teles said her husband’s body should be sent to London as she wanted to complete the formalities relating to his burial. Agreeing to the court’s order, the probe agency submitted that it will get the body embalmed and dispatched to London on its own expenses from where Pinto’s wife may collect it. A paralytic stroke had left Pinto severely immobilised and he had been urging the Delhi High Court and the Supreme Court to let him return to London on a personal bond. He had been in detention for almost 13 years. The DFDR was handed over to the air safety team of DGCA for bringing it to its headquarters in Delhi. “The DFDR, though impacted by the crash, will be subjected to various tests for decoding the data it contained,” a DGCA spokesman said. The spokesman said they carried out an intense search of the “wider area” at Mangalore crash site with the assistance of state government officials and other specialised technical personnel today. “As a result of the investigations today, the team recovered the black box,” he said. The investigators recovered the cockpit voice recorder (CVR) and digital flight data acquisition unit (DFDAU) of the aircraft on Sunday. The Boeing 737-800, belonging to Air India Express, overshot the runway and crashed early in the morning on Saturday after touching down the Mangalore Airport, leading to the death of 158 persons among the 166 who were on board. The plane was coming to Mangalore from Dubai. The CVR and the DFDR are both popularly called “black box” and modern airplanes are equipped with two “black boxes”. Both recorders are kept at the tail section of an aircraft as the rear portion is considered the most crash survivable part of an aircraft. The DGCA, however, preferred to call only the DFDR as the “black box”. 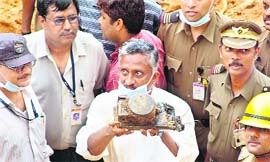 When the CVR was recovered two days ago, the DGCA refrained from describing it as the “black box”. The DFDR records many different operating conditions of the flight such as time, altitude, airspeed, heading, etc. With the data retrieved from the DFDR, investigators can visualise the airplane's attitude, instrument readings, power settings and other characteristics of the flight. The data can also be used for generating animations enabling the investigating team to visualise the last moments of the flight before an accident. The CVR records the flight crew's voices, as well as other sounds inside the cockpit. Sounds of interest to an investigator could be engine noise, stall warnings, landing gear extension and retraction, and other clicks and bursts. From these sounds, parameters such as engine rpm (revolution per minute), system failures, speed, and the time at which certain events occur can be determined. Communications with Air Traffic Control, automated radio weather briefings and conversation between the pilots and ground or cabin crew are also recorded on CVR. The recovery of DFDR and CVR is expected to provide vital clues with regard the reasons of the tragic crash. Analysing the data from DFDR and CVR is expected to take about 15 days’ time. BJP deputy leader in the Lok Sabha Gopinath Munde had forcefully backed the demand of Lalu Prasad Yadav, Mulayam Singh Yadav and Sharad Yadav to include the caste column in current census enumeration. But RSS general secretary Suresh Joshi, popularly known as Bhaiyaji Joshi, opposed the proposition while talking to newsmen in Nagpur on Sunday. He suggested making nationality and not caste the basis of census. “Right from the beginning, the RSS favours a casteless society and any attempt to dilute it will hurt the sentiments of people,” Joshi said. He added, “The recent demand for identifying people on caste basis, especially with a view to ascertaining OBCs’ strength, will cause social friction and nullify all efforts of the RSS and other social organisations to bring about social harmony in the country,” and felt that classifying people on caste lines would harm social fabric and harmony. But the RSS stand did make immediate difference to the BJP and taking a cue, BJP spokesman Ravi Shankar Prasad changed his party’s tune today and asked Prime Minister Manmohan Singh to hold wider consultations on this by calling an all-party meeting. But he circumvented the issue when reminded that his party had already demanded caste-based Census in Parliament and the Prime Minister had made a commitment following a consensus among all parties in the House. He wanted the government to amend the National Population Register (NPR) form to prevent Bangladeshis and Pakistanis from surreptitiously becoming Indians. While both parties have been maintaining apparent distance from each other and formally denying any direct contact, JMM general secretary Suthankar Bhattacharya met AICC in charge of Jharkhand K Kesava Rao at the latter’s residence this afternoon. The meeting lasted quite sometime. But nothing seems to have come of it as yet, said sources. Kesava Rao though denied it. “Not a single JMM man met me. I had warned them (JMM leaders) when they were forming the government with the BJP that the party would dupe them and use blackmailing tactics and backstab them. The BJP cannot tolerate a tribal CM,” he said. However, sources admitted that Congress leaders are not discouraging JMM leaders from meeting them. Sources said Congress wants to wait till May 31 when Soren has to seek a vote of confidence and perhaps ditch him on the floor of Assembly. Even JMM leaders understand it is not easy to persuade the Congress to support them at this stage. A JMM insider admitted that the Congress has conveyed to the JMM that a lot will depend on JVM leader and Congress’ coalition partner Babulal Marandi, who is opposed to rescuing Soren from this crisis at this juncture. But, on the other hand, knowing the politically fickle temperament of Soren, Congress leaders also fear Soren going back to the BJP again and the latter changing its decision at the last minute. That is why the Congress is not inclined to open its cards till the last minute, said party sources. “The matter was taken up immediately with the Canadian High Commission,” Foreign Secretary Nirupama Rao told reporters here. New Delhi was taking the matter very seriously. Last week, the Canadian High Commission here refused a visa to Fateh Singh Pandher, a retired BSF constable, on grounds that he was associated with a “notoriously violent force”. The denial of visa and the reason given for it sparked public outrage in India, compelling the Canadian authorities to immediately issue a clarification. “I would like to stress Canada has the highest regard for India’s democratic institutions and processes. Canada has great respect for India’s armed forces and related institutions,” Canadian foreign ministry spokesperson Catherine Loubier said in an e-mail statement. East Central Railway chief public relations officer Dilip Kumar said the derailment took place at Amba village around 6:30 am when the train was on way to Guwahati from New Delhi. The driver of the train applied emergency brakes after hearing the sound of an explosion on the tracks, which apparently led to the derailment, Kumar said. However, the exact cause was still to be ascertained, the CPRO said. The possibility of sabotage was also being examined. Police has denied suggestions that it was the handiwork of Maoists. Kumar said a statutory inquiry by the Commissioner of Railway Safety, Eastern Region, RP Yadav, has been ordered into the cause of the derailment. 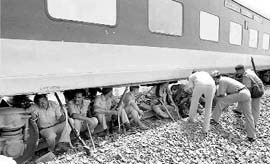 The injured passengers were administered first aid on the spot, Kumar said, adding teams of doctors from Katihar and Barauni soon reached the spot to provide medicare. Bhatkal was arrested by the Maharashtra Anti Terrorism Squad (ATS) yesterday from Mangalore for allegedly supplying fire arms to three other arrested accused last year. He was produced before the Mazgaon metropolitan magistrate. Asked by the court if he wanted a state-appointed lawyer to defend him, he said, “No, I would appoint a lawyer for myself at a later stage.” In August 2009, three persons were arrested from south Mumbai for possession of illegal firearms, which, according to the ATS, were supplied by Bhatkal. Dhananjay Ashtekar from the Konkan belt of Maharashtra provided technical knowhow and collected devices for preparing IEDs, which were successfully tested twice in two different states before October 16, 2009, when the blasts took place. During the probe, the state police and the NIA had zeroed in on Ashtekar and had found different electronic items required for assembling IEDs from his rented room. Ashtekar is a student of DKTE Engineering College at Ichalkaranji and had downloaded the circuit diagram and later given it for printing at a shop in Kolhapur. The chargesheet, filed on May 17, mentions that Ashtekar, during July to September 2009, had contacted the owner of the shop, Rajesh Sonar, for preparation of printed circuit boards as per the diagram provided to him. Sonar, had told the NIA that he had prepared 18 printed circuit boards on the basis of four circuit diagrams provided by Ashtekar, one of the youngest accused in the case. The investigations also revealed that Ashtekar had written 'On' and 'Off' directions on five IEDs in his own handwriting at the time of preparing IEDs. The IED work also led Ashtekar to Mumbai. The accused had purchased two transistors from a shop in south Mumbai's Lamington Road, the NIA said. Another accused Vinay Talekar had also purchased five 9 volt batteries and two insulation tapes for making IEDs from a shop in Goa's Ponda town. Some relief appears to be in sight for Punjab, Haryana, western UP, in fact for most of the areas in the Indo-Gangetic plains. For, the IMD has predicted fairly widespread rain and thundershowers over western Himalayan region and scattered dust storm and thunderstorms in northwestern plains from Thursday onward for next two days, which will bring the mercury down in the region. IMD director Brahm Yadav today said that relief is expected in the region from May 27 due to a western disturbance. “There will be a fall in temperatures in the entire Indo-Gangetic region from May 27 onward for the next couple of days. While no major change in maximum temperatures over northwest and adjoining central India is expected during the next 48 hours, scattered rain and thundershowers from Thursday onward will definitely bring the mercury down,” Yadav said. Another positive feeler appears to be coming from the monsoon end. The director of the Pune-based National Climate Center, Shvanand Pai, told The Tribune that the May 30 forecast for Kerala stands. In other words, cyclone Laila did not have a major effect on the monsoon system. “Cyclone Laila has weakened and now monsoon will start establishing in the south. There has been some weakening in the monsoon system since both the cyclone and the monsoon were competing for the same moisture,” he said. Initially the monsoon had latched on to Laila -- an association that later broke off. The breaking-off pitted Laila against the monsoon with both competing for sea moisture. Another positive sign in the favour of monsoon is the fact that another cyclone system - Bandhu -- building in the adjoining east-central Arabian Sea has also weakened. “Bandhu, a cyclone building in the Arabian Sea, has also weakened and now the southwest monsoon will slowly get established. Some rains have already started in Kerala. When monsoon approaches, some moisture will start coming,” Pai said. Monsoon rains are expected to hit country’s mainland at Kerela by May 30. Notably, some weather experts had blamed Aila cyclone in May 2009 for poor performance by monsoon last season. The last monsoon update was brought out by the IMD on May 21 -- a day after Laila hit Indian mainland. Talking to reporters here, Foreign Secretary Nirupama Rao said the decision of the Pakistan Supreme Court had disappointed New Delhi since India regarded Saeed as one of the masterminds of the 26/11 terror attacks. She said New Delhi had provided sufficient evidence to Pakistan on the role of Saeed, who had even openly called for ‘jehad’ against India. She also recalled the JuD had been declared a proscribed organisation by UN Security Council. Nirupama said Pakistan had assured India recently at Thimphu that it would not allow the misuse of its territory for terrorist activities directed against India. “We hope Pakistan will be sensitive to our concerns and taken meaningful action” against elements like Saeed. Meanwhile, sources in the PMO said Manmohan Singh had also sent a letter to the Pakistani premier along with the consignment of mangoes. Both the mangoes and the letter would be handed over to the office of the Pakistani Prime Minister by the Indian High Commission in Islamabad. The PM took the initiative of sending the mangoes after a fruitful meeting with Gilani on the margins of the SAARC Summit in Thimphu last month when they decided to reduce the trust deficit between their two countries. External Affairs Minister SM Krishna is slated to visit Islamabad on July 15 for talks with his Pakistani counterpart Shah Mehmood Qureshi on how the two countries could sort out the issues between them. The leaders of India and Pakistan have conducted the ‘mango diplomacy’ even in the past, regardless the state of relations between the two nations. In the early 1980s the then Prime Minister Indira Gandhi and Pakistani leader Gen Zia-ul Haq exchanged ‘Anwar Rataul’ mangoes. In 2001, Gen Pervez Musharraf had sent mangoes to the then prime minister Atal Bihari Vajpayee and Home Minister LK Advani. The award comprising a trophy and a cash prize, instituted by the Marico Innovation Foundation, was presented to DIHAR director Dr Shashi Bala Singh at a function held in New Delhi this week. Facing charges of financial irregularities that include allegations of bid-rigging and proxy investment, Modi explained why he wanted Manohar to stay out of the decision-making process. “..I am constrained to prefer the present application for your kind consideration that you may consider recusing yourself from participating any further in the proceedings relating to complaint and show-cause notice as your participation in the proceedings would tantamount to being a judge, witness and a potential co-notice in these very proceedings,” Modi said.